What to cook when you are full of inspiration yet lacking ingredients? Look in the cupboard, find the basics. Flour, check. Sugar, check. And in the fridge: milk, butter, eggs. Check! With these ingredients (and, some vanilla) you can make a simple yet delectable dessert. An optional extra is whatever is in your fruit basket at the time, in this case a banana. Firstly, make the caramel. It stays hot for a long time so it won’t matter if it sits there for a few minutes while you make the custard. I used Elise’s recipe over at Simply Recipes, it’s a great tutorial. Be careful though, when you add the cream it really does froth up!! Took me a little by surprise but worked out great. Combine all ingredients, except the vanilla, in a medium saucepan (a whisk works well to make a smooth mixture). Cook over low heat, stirring all the time, until it thickens & boils. Stir in the vanilla essence. Makes 3-4 serves. 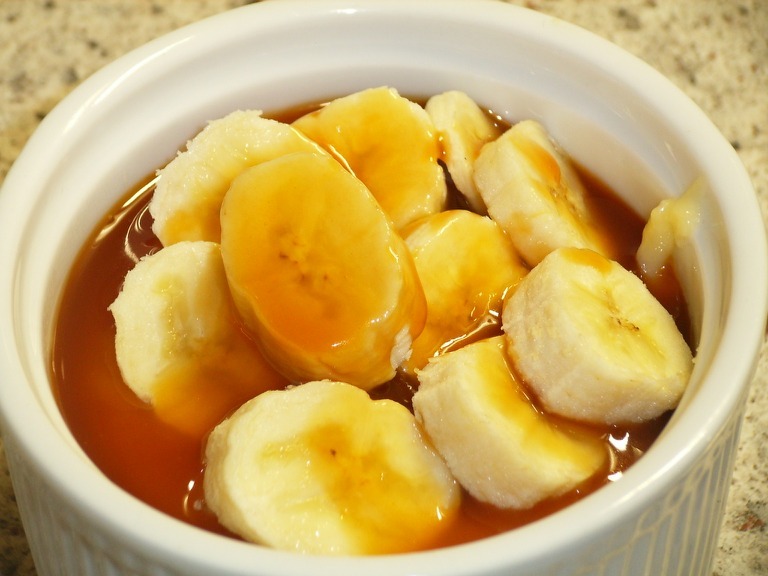 Serve into small bowls or ramekins, add your fruit of choice if desired, and spoon over a little caramel sauce to top it off (it’s very sweet, I only had a little bit). The caramel recipe makes too much, but it keeps for two weeks in the fridge. I love my homemade custard. I have never ever bought boxed custard from a store, and as long as I have this recipe, I never will! This entry was posted on September 27, 2008 at 9:17 pm and is filed under Sweets. You can follow any responses to this entry through the RSS 2.0 feed. You can leave a response, or trackback from your own site. That does look delicious! Love the bananas in the custard.